Ready for an exciting day on the Apalachicola Bay or River? Captain Tommy will show you how to catch fish! Captain Tommy Holland is a native of Apalachicola and has been fishing the bays, beaches and river all his life. 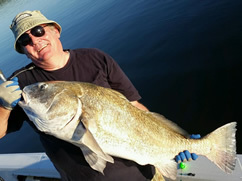 Targeted species include Redfish, Speckled Trout, Tripletail, Flounder, Pompano, Black Drum and Tarpon. Captain Tommy guarantees you will catch a lot of fish and have a great time! Click here to book your Apalachicola Bay Fishing trip today!